We recently had a situation at John Deere where a particular gear failed during testing before it was desired. 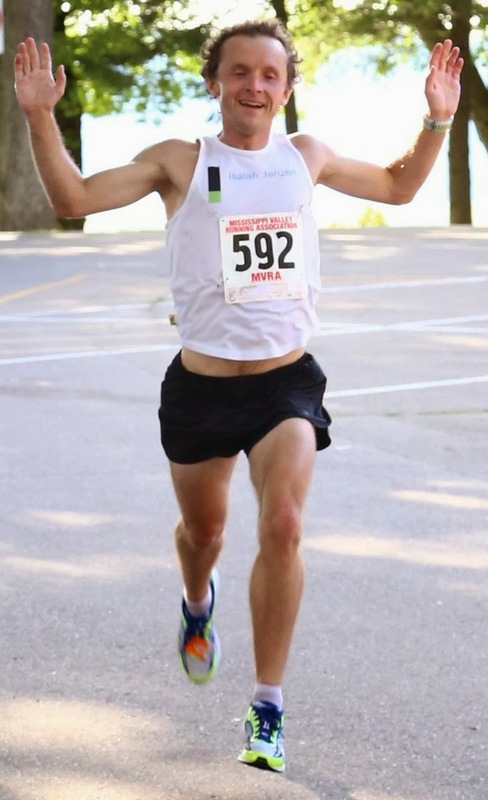 There were a number of complications with the testing and the gear is just part of the picture. In other words, we caught a number of issues during the normal testing process so that when the product is eventually released with the new modifications it will last years in the field, without a question. 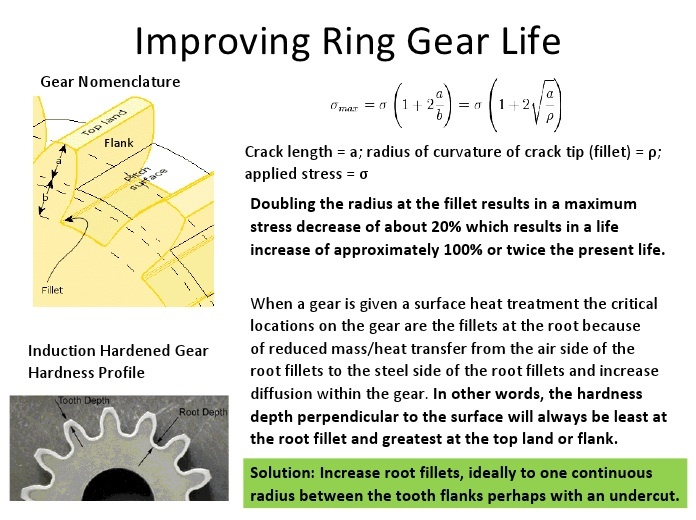 Since heat treating ring gears is my specialty I took the initiative and started asking questions. On a tangent, Google: "heat treating graduate school" with or without quotes and WPI is the only college that comes up in the top ten with a result for a graduate degree. In other words, did I go to the #1 school in the world for heat treating graduate programs? Anyway, as I started asking questions I desired to give my input, even though I am clearly not responsible for the gear or the testing in any way. Engineers do quite a bit of trying to communicate to other people via presentations, so I created a PowerPoint. It is the best presentation I have made during my working career and possibly ever. Take a look for yourself. As you can see, there is a significant amount of simplicity. It is only one slide. There are pictures, an equation, color, bold typeface, and quantifying numbers. I just gave you months of education, in the space of about three tweets. 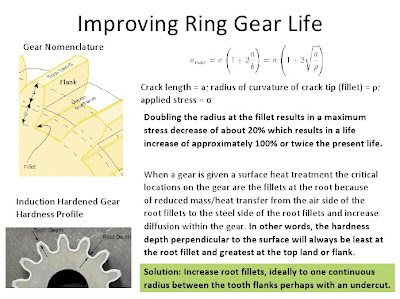 This information is not specific to ring gears, but ring gears are typically expensive and prone to failure. Lest anyone has the idea that the solution is always this simple, there are often other constraints like the bolts to the ring gear, the manufacturer we outsource the gear from, and the other components in the system (like a pinion gear) that will all be affected by changes to the design or heat treating recipe. Honestly, I would be pretty happy just designing gears and transmissions. Happy engineering!